Hamsters and Dragons. All Right! James Cartwright is a comic creator and writer who has recently started releasing his material on the Internet. 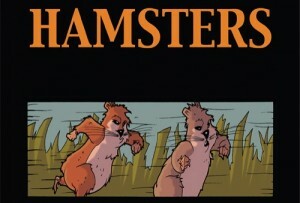 Hamsters (illustrated in full-color by Mike Ratliff) is described simply as “Two hamsters venture outside their cage to escape from the clutches of their evil owner, a nine-year-old girl.” Gotcha! Then there’s Rocky Mountain Fire Lizard (also in full color by Pellegri), which goes like this: “As railway tracks are laid across Colorado’s rocky terrain, a dragon awakes from its slumber. A farm boy and privileged girl chase after the monster to be the first to collect the bounty on the creature’s head.” You can find out more about Cartwright Comics, including links to buy them, at the Journal of the Lincoln Heights Literary Society (whew! ).